This research paper evaluates the externalities that have ensued from the rise in consumption of electronic products. The atrophy of these products in developing countries has led to adverse health effects that disproportionately impact marginalized groups such as people of color, women, and children. The transboundary nature of this environmental problem has resulted in researchers often analyzing the issue within the framework of a stark Global North vs. South dichotomy. I attempt to break down this binary by considering the role of the World Trade Organization (WTO), the effectiveness of major directives such as the Basel and Rotterdam Conventions and the prevalence of non-state actors such as the Basel Action Network. In turn, I restructure the framing of electronic waste disposal in order to place the onus on producers, who have the greatest responsibility and access to resources in order to mediate the environmental degradation caused by the dumping of electronic waste. Environmental regimes are driven by public outcries that ensue from the discovery of a negative externality in the environment. These externalities often come from powerful industries during the manufacturing process. Increased production and globalization has led to an exponential growth in environmental degradation. One of the greatest problems that has come from these unchecked industries is the rise in the consumption of electronic products. In the last century, the vast majority of this consumption has come from the Global North. In Bill McKibben’s book, Maybe One, he argues that after years of gluttonous consumption, the North has to begin sacrificing in order to create space for the South. This is reframing the concept of ecological debt, in which the Global North owes the South for its history of dominating production, thus perpetuating environmental degradation. McKibben argues that there can be more consumption overall as long as there is a shift in which countries are consuming more. This approach signals maturity, in which there is a shift from a North-centric structure to that of equality. Currently, both producers and consumers in the Western Hemisphere create and dispose of electronic products with little to no consideration of their effect on developing countries. One key strategy for reigning in the expanse of electronic waste follows the philosophy of Promethean Environmentalism, where technology and innovation help alleviate environmental degradation rather than exacerbate it. This idea appeals mostly to “societies of comfort,” countries that are accustomed to a high degree of luxury, and are unwilling to make drastic changes to their qualities of life for environmental concerns. Collective action problems help explain why countries are unwilling to sacrifice luxury goods and technology. For instance, former president George W. Bush pulled out of the Kyoto Protocol in 2001 after citing that it did not hold developing countries accountable for emitting too much CO2. Here, Bush exemplifies the fear of “free-ridership,” in which the distribution of economic costs and sacrifice are imbalanced. This stands in contrast with McKibben’s philosophy that there needs to be collective action defined by trust in order to optimize the balance of sustainability and production. The plight of electronic waste began with the discovery of health hazards linked to chemicals found in products when they began to deteriorate. Electronic waste is extremely toxic, containing lead, mercury and arsenic in high concentrations. Since these chemicals are not prone to natural degradation in the environment, they have lasting impacts on human health, including poor fetal development and nervous system damage. Electronic waste health effects primarily enter through the food chain. This occurs through the grazing of livestock and the seeping of toxins found in e-waste into agricultural areas. The toxins then bioaccumulate and biomagnify through the food chain. These toxins are often in the form of polycyclic aromatic hydrocarbons and as persistent organic pollutants (POPs). Methods for disposing of waste involves using highly concentrated acidic solutions to dissolve the metals and mechanically shred the plastics involved. In 2014, UNEP deemed electronic waste the fastest growing waste stream in the world. Despite increasing health hazards, the growth of production and the drag of substantial, effective legislation led to delayed global awareness. In the age of the ‘information economy,’ it is hard to comprehend the scale of electronic waste that is being transported. NGOs have estimated that between 50 to 80 percent of electronic waste that is consumed in Canada and the United States is processed in socioeconomically marginalized countries, often by hand. However, the troubling component of the transboundary movement of waste is that, while it does cause environmental and health hazards, it also has the potential to provide economic opportunities. Developing countries are economically incentivized to accept not only reusable electronic waste, but harmful and toxic waste with no community benefit. There is a direct correlation between decreasing GDP as the rate in which countries import waste increases. In recent years, there has also been a surge of waste transport between developing countries. This form of transportation has fewer regulations, since it does not hold the same saliency of injustice as the Global North to South relationship. The World Trade Organization (WTO) plays a major role in the movement of transboundary waste. Through its promotion of free trade, the WTO often encourages the movement of electronic waste with the hope that it will ignite economic opportunities for developing countries. This perspective is short-sighted. Reparation costs of fixing both the environment and impacted individuals will most likely equal, if not surpass, the profits that these developing countries gain by attempting to repurpose electronic waste. However, members of the WTO do have the sovereign right to protect their people and environment if engagement in trade threatens their society. The temptation of economic opportunities from electronic waste often deters developing countries from reducing trade. The WTO frowns upon any form of trade restriction, though, and keeping this in mind, developing countries may withhold from adopting restrictive policies. As a result, looking towards non-trade-restrictive remedial measures is the favored approach because economic interdependence is optimized and helps to support the GDP of all parties involved. In early November 2017, China pitched the “National Sword” campaign against foreign waste being disposed of in the country. Through the ban, 24 different grades of waste will be restricted from entering the country. The WTO has yet to ratify the proposal. In its submission for review to the WTO, the government cited significant degrees of environmental degradation as grounds to limit the amount of waste imported. Although addressing this issue in the short-term will require redirecting recycling locations, long-term solutions lie in the adoption of Extended Producers’ Responsibility. This shifts the onus of waste disposal to the countries that produce it, rather than from the disposal end. The Basel Convention is the most significant and well-known international transboundary waste management agreement to take place. The convention took place in 1989, and was a multilateral agreement (MEA) with 180 parties that agreed to regulate the transboundary movement of hazardous waste. Its primary role is to prevent countries from receiving hazardous waste when they do not have an environmentally sound system of processing the material. Exports are allowed when they can be processed in an environmentally sound manner or when used as raw materials. The Ban Amendment of 1995 prohibits export of all hazardous wastes incorporated in the Convention from Annex VII countries (Organization for Economic Cooperation and Development [OECD] & EU countries) to all others. After years of legal disagreement, the amendment has ended in a stalemate. However, 74 of the countries in the Convention have ratified it. The Ban Amendment contradicts the ideologies of trade liberalization and globalization of the Washington Consensus. This leads to corporations needing to address their production methods instead. Gaps in the Basel Convention include the United States inability to ratify it, as well as electronic waste not being included in the definition of hazardous waste. The discrepancy in wording leads electronic waste to often go unregulated by the Basel Convention. The Rotterdam Convention of 1998 also served as a significant step towards managing the international trade of hazardous waste. The Convention stemmed primarily from awareness of the health implications of pesticides on human health. The most significant aspect of the MEA was the inclusion of the legally binding Prior Informed Consent Procedure, which is designated “for certain hazardous chemicals and pesticides in international trade.” The specificity in wording makes it evident that the Convention was in direct response to specific cases of harm caused by pesticides. The treaty, which was implemented in 2004, planned on improving upon voluntary prior informed consent procedures that were already in place internationally by facilitating information exchange about the chemicals. Rotterdam primarily built upon the preceding voluntary guidelines instituted by UNEP and FAO in 1989. The most recent treaty in the series of international MEAs regarding hazardous waste was the Stockholm Convention, which was ratified in 2001. The treaty targets POPs that adversely affect human health and the environment. The Convention substantially limited or banned the use, production, and trade of 12 particularly harmful pollutants, which are often known as the “dirty dozen”. POPs are defined in the Convention as having four key characteristics: bioaccumulation, transport over significant distances, toxicity and environmental persistence. However, brominated flame retardants, which are restricted through the convention, continue to be used in electronic products. As a result, they are still being detected in the global recycling flow, particularly in West African countries such as Nigeria. The European Union has taken on a more targeted approach to electronic waste regulation. The EU’s Waste Electrical and Electronic Equipment (WEEE) directive has targets for the recovery and recycling of all electrical products. Along with the WEEE directive, the EU also passed the Restriction on Hazardous Substances Directive (RoHS). Both directives were passed in February 2003 as a means to address electronic waste disposal in Europe. EU’s RoHS was momentous because it restricted the use of six toxic components, including lead, mercury and cadmium, in electronic equipment. Increasingly eco-friendly electronic products are not always financially feasible for developing countries, however. The targeted initiatives by the EU have showed some promise in setting a standard for producers, but they still do not cover the consumption of the United States and other hegemonic states. The inability of the U.S. to ratify the Basel Convention created regulatory gaps that non-state actors were able to fulfill. Often in environmental regimes, non-state actors’ main role is in creating public awareness around issues. This took place in the electronic waste regime through the NGO Greenpeace International, which raised awareness about e-waste disposed of in Asia. This formed a basic understanding of how developed countries were dumping waste in a non-environmentally sound manner. However, other organizations like the Basel Action Network (BAN), took more pointed action at countries as well as producers in remediating environmental waste production and disposal. BAN targeted producers by cornering major corporations through the creation of certification incentives. Among the most prominent of these corporations was Hewlett-Packard, which eventually adopted a producer responsibility framework after being embarrassed and coerced by BAN. One of the crucial disposal certification programs of BAN is the “Responsible Recycling Practices for Use in Accredited Certification Programs for Electronics Recyclers” (R2). This is an upstream supply chain regulatory target, as it is focused on the post-consumer phase. BAN developed most of these initiatives through its e-Steward program which attempts to legitimize the Basel Convention by incorporating its language into its initiatives. One of the greatest challenges with electronic waste is the vague wording in the Basel, Rotterdam and Stockholm Conventions. In order to appeal to dozens of countries in the agreements, it became necessary to ignore certain facets of hazardous waste that are innately part of the toxic international flow of disposal. Electronic waste is not inherently considered a hazardous waste, particularly if it is advertised as reusable, raw material. However, electronics clearly encapsulates heavy metals and harmful chemicals that are concealed by their complex manufacturing. Although substantially more specific, the European Union’s WEEE directive also struggles with enforcement. The gap between the regime of electronics and waste management, is distinct. In tackling the electronic waste regime, a holistic approach of equally targeting the production as well as disposal is necessary to effectively reduce the hazards that ensue from e-waste. The directive closely followed the underlying regulatory principle, which is also known as the “cradle-to-grave” approach. However, this still allowed for producers to include hazardous chemicals in the manufacturing of electronics. This has caused the directive to be inefficient. The significant amount of resources that are spent on remediation are superfluous given that the production could have factored in the disposal from the start. There has also been a conflation of the initiative’s success with increasing metal prices, which has encouraged firms to reuse as many precious metals as possible in production. Only 13% of the electronic waste assessed by the WEEE is disposed of in landfills or incinerated, compared to the more than 90% of waste that was disposed of in this way in 2000. Studies have shown that transported waste is not being documented properly if it contains hazardous materials, which also accounts for the substantial decrease in disposal percentages. The directive has made an impression on the waste management component of electronic waste, but has yet to outline the exact way of forcing producers into not using hazardous materials. In order to effectively address the electronic waste regime, it is necessary that the international community acknowledges its changing nature in the last decade. In 2012, the UNEP released a study called “Where are WEEE in Africa?” The report unveiled the status of electronic waste disposal in five different countries. It found that 5% of all European waste is still illegally disposed of on the continent. The important component is that increased local use of electronic products has caused a jump to 85% of waste being materials that were consumed domestically. The emerging problem therefore is that there are still no local facilities to process these products. The problem is shifting from a Global North vs. South relationship to one that is insulated within developing countries. This may serve as a disincentive for developed countries to fund recycling facilities for these regions. To show how rare sufficient recycling facilities are, one located in Germany is only one of five in the world which is properly equipped to take apart the components of a circuit board. When the Basel Convention was drafted, trade from Annex VII (developed) countries to non-Annex VII countries accounted for 35% of total trade that needed to be monitored. In 2012, it was found that it only accounted for 1%. This reshapes the traditional framing of the problem from being strictly a Global North verses South environmental regime, to being exclusively founded on environmental injustice. Although the disposal of electronic waste is shifting away from one of classical injustice between states, it is evident there is still an imbalance of power at play. The tech industry is now holding the authority that hegemonic states once did. In turn, the tech industry’s continual refusal to rethink the design of tech products is perpetuating the horrendous living conditions of developing countries. Multilateral funding facilitated by the United Nations or another international institution could create the capacity and resources for these developing countries to mitigate local environmental damage. Electronic wastes contain predominantly re-workable and re-sellable equipment, and as a result non-Annex VII to Annex VII electronic trade has become much more significant. This fact makes the main goals of the Basel, Rotterdam and Basel Conventions extraneous as waste streams reshape and require new legal parameters. Within these regime gaps it is evident that complete elimination of hazardous waste and electronic products needs to come from the producers. A variety of tactics, ranging from public harassment of producers to economic incentives, has pushed producers to adopt a greater responsibility in the disposal of hazardous waste. The true irony of the electronic waste regime is that tech companies, who proclaim themselves a “clean industry,” are the producers of such a significant proportion of the globe’s most toxic waste. A computer monitor alone contains several pounds of highly toxic substances. The vicious cycle of the increasing efficiency of electronic devices only leads to an exponential growth of waste as people leap for new gadgets on a regular basis. This is the concept of Moore’s Law, in which processing power doubles every eighteen months into the indefinite future. This idea was conceptualized by the founder of the Intel Corporation, Gordon Moore. This feeds into the strategy of planned obsolescence, in which firms deliberately design their products to deteriorate after a relatively short period of time. Although producer responsibility initiatives have emerged as a tactic in checking electronic waste, planned obsolescence has remained difficult to regulate. One of the greatest successes of the electronic waste regime has been the Computer TakeBack Campaign. The International Campaign for Responsible Technology (ICRT) includes a substantial number of the environmental groups that have been involved in the global initiative. The conglomerate’s main mission is for producers to take responsibility for the entire life cycle of their products through effective MEAs. There have been domestic directives in targeting producers, such as the EPA’s National Electronic Products Stewardship Initiative (NEPSI), which in actuality has no true regulatory teeth. The initiative collapsed as environmentalists and corporations diverged in their visions of what take-back programs would look like. Tech giants often avoid having take-back services in developing countries (such as Apple, Microsoft, Panasonic, Philips, Sharp, Sony and Toshiba) although they have them in place in countries like the United States that hold more social capital. However, with help from the BAN, CBTC managed to investigate, embarrass and force Dell and Hewlett-Packard into adopting a comprehensive pledge of producer responsibility—all within a span of a few years. CBTC operates on the assumption that effective change needs to come from within industries, not governments. Ineffective international governance, coupled with the transboundary nature of the electronic waste regime, has led to the emergence of hegemonic companies rather than states. These firms dominate the industry and therefore need to be coerced as defecting nations traditionally are, by NGOs in other environmental regimes. There have been some attempts at producer responsibility clauses in governance. The European Union’s WEEE directive provides a brief suggestion of conscientious electronic goods production. The section on producer responsibility says, “Member states shall encourage the design and production of electrical and electronic equipment which take into account and facilitate dismantling and recovery, in particular the reuse and recycling of WEEE, their components and materials”. This section provides no clear guidelines as to how states should encourage this type of production, not to mention any repercussions for firms that do not comply with the clause. With increasing public exposure, companies are starting to have to pay the costs of including harmful chemicals in production. In late November of 2017, DirecTV was required to pay a $9.5 million settlement because the firm had illegally dumped hazardous waste. An investigation conducted by Alameda County found that all 25 facilities in California were improperly dumping batteries, electronic devices and other hazardous wastes in the vicinity. The trend of firms being exposed, and having to pay for the market failure of hazardous externalities, will hopefully begin to convince companies to eliminate the materials from the production process entirely. Robinson, Brett H. “E-Waste: An Assessment of Global Production and Environmental Impacts.” Science of the Total Environment, vol. 408, no. 2, 2009. McKibben, Bill. Maybe One: A Personal and Environmental Argument for Single-Child Families. (New York: Simon & Schuster): 161. 1998. Maniates, Michael and John M. Meyer. The Environmental Politics of Sacrifice. (Cambridge, Mass: MIT Press): 40. 2010. Svendsen, Gert T. “Soft or Tough Guys in Kyoto? Free-Rider Incentives and the Samaritan’s Dilemma.” International Journal of Global Energy Issues, vol. 23, no. 4 (2005): 281. Raffael, Nick. “iDump: How the United States should use Disposal Bans to Legislate Our Way Out of the Electronic Waste Crisis.” William and Mary Environmental Law and Policy Review 39, no. 2 (2015): 483. Borthakur, Anwesha. “Health and Environmental Hazards of Electronic Waste in India.” Journal of Environmental Health 78, no. 8 (2016): 23. ProQuest. Wood, Molly. Recycling Electronic Waste Responsibly: Excuses Dwindle. The New York Times, 31 Dec. 2014. Accessed Nov 7, 2017. Lepawsky, John and McNabb, Chris. 2009. Mapping International Flows of Electronic Waste. The Canadian Geographer. Christian, Gideon Emcee. “Trade Measures for Regulating Transboundary Movement of Electronic Waste.” Utrecht Journal of International and European Law 33, no. 85 (2017): 105. Robertson, Jamie. The Chinese Blockage in the Global Waste Disposal System. BBC News, 19 Oct. 2017. Accessed Nov. 9, 2017. Renckens, Stefan. 2013. The Basel Convention, US Politics, and the Emergence of Non-State E-Waste Recycling Certification. Dordrecht, Netherlands: Springer Science & Business Media: 142. ProQuest. Barrios, Paula. “The Rotterdam Convention on Hazardous Chemicals: A Meaningful Step Toward Environmental Protection?” Georgetown International Environmental Law Review 16, no. 4 (2004): 679. Ogunseitan, Oladele A. “A Russian Roulette with the Rotterdam Convention.” Jom 67, no. 11 (2015): 274. Mulvaney, Dustin. Green Politics: An A-to-Z Guide. 1st Edition. Los Angeles: Sage Publications, 2011: 376. Babayemi, Joshua; Sindiku, Omotayo; Osibanjo, Oladele & Weber, Roland. “Sustance Flow Analysis of Polybrominated Diphenyl Ethers in Plastic from EEE/WEEE in Nigeria in the Frame of Stockholm Convention as a Basis for Policy Advice.” Environmental Science and Pollution Research 22, no. 19 (2015), p. 14503. 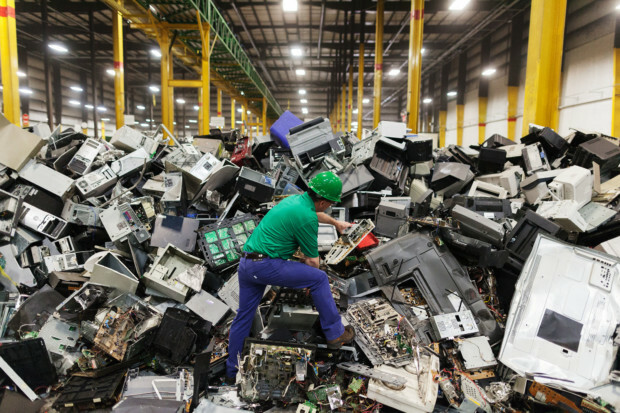 “Waste Electrical and Electronic Equipment (WEEE).” European Commission, The Environment. 24, April 2017. http://ec.europa.eu/environment/waste/weee/index_en.htm. Brigden, Kevin, Iryana Labunska, Dabid Santillo, and Michelle Allsopp. “Recycling of electronic wastes in China and India: workplace and environmental contamination.” Greenpeace International (2005): 55. McDonough, William & Braungart, Michael. Cradle to Cradle: Remaking the Way We Make Things. North Point Press, New York (2002). Lauridsen, Erik Hagelskjær & Jørgensen, Ulrik. “Sustainable Transition of Electronic Products through Waste Policy.” Research Policy 39, no. 4 (2010): 486. ScienceDirect. Lubick, Naomi. “Shifting Mountains of Electronic Waste,” Environmental Health Perspectives (2012). ProQuest. Lepawsky, Josh. “The Changing Geography of Global Trade in Electronic Discards: Time to Rethink the e-Waste Problem.” The Geographical Journal 181, no. 2 (2015): 148. Rauschenbach, Thomas M. “Competitiveness and Cooperation in a Global Industry.” International Journal of Technology Management, vol. 3, no. 1. 2009: 345. Pellow, David Naguib. Resisting Global Toxics: Transnational Movement for Environmental Justice. (Cambridge, MA: MIT Press, 2007): 185. Greenpeace. (2008). Take back blues: An assessment of e-waste take-back in India. Accessed November 27, 2017. Retrieved from www.greenpeace.org/india/press/reports/take-back-blues. EC, 2002a. Directive 2002/96/EC on Waste Electrical and Electronic Equipment (WEEE). The European Commission, Brussels. Associated Press. DirecTV to Pay $9.5M to Settle Hazardous Waste Allegations. The New York Times, 22 Nov. 2017. Accessed on Dec. 5, 2017.